From Pixels to Animation: An Introduction to Graphics Programming deals with the C programming language, particularly for the Borland C and Microsoft C languages. The book reviews the basics of graphics programming, including graphics hardware, graphs, charts, changing colors, 3D graphics, high level functions provided by Borland and Microsoft C. The text also explains low-level graphics, getting around the limitations of standard, graphics libraries, SVGA programming, and creating graphics functions. Advanced topics include linear transformations, ray tracing, and fractals. The book explains in detail the aspect ratio of pixels (length of the pixel dot divided by its width), pixel colors, line styles, and the functions to create the graphic. The text also describes the presentation of a three-dimensional object by using perspective, shading, and texturing. Between the operating system, which carries out the instruction of the program, and the hardware, which displays the output of the program, is the Basic Input/Output Services (BIOS). The BIOS is a set of routine instruction inside the different parts or hardware devices in the computer. The book explains programing animation effects by utilizing routines provided by Microsoft or Borland. The text also notes that a programmer can create good animation effects by directly addressing the graphics adapter, bypassing the BIOS or the high-level routines created by Microsoft or Borland. 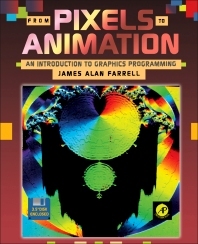 The book is suitable for beginning programmers, computer science, operators, animators, and artists involved with computer aided designs.